Pump is pneumatically operated i.e. 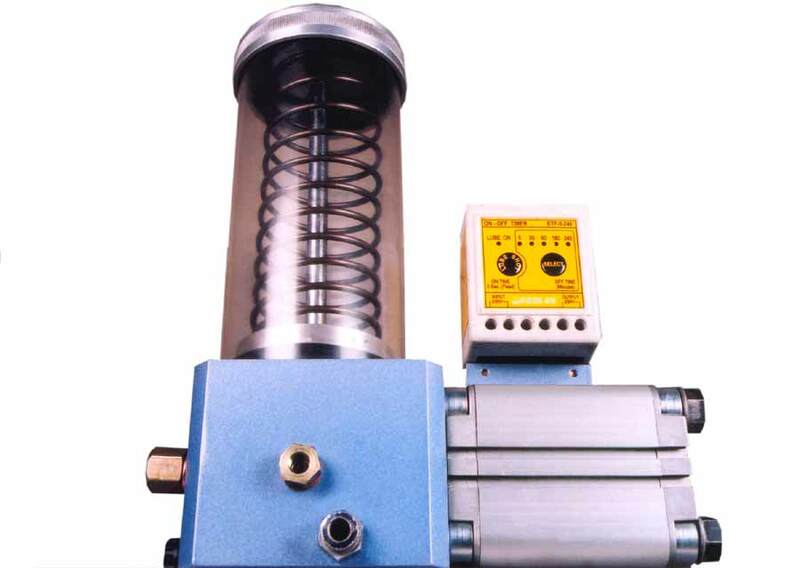 through pneumatic line, connected to the ports of cylinder. The cylinder is built in with the pump. During ON period of the pneumatic line, piston inside the cylinder is pushed, ejecting out pressurized grease from the outlet port of the pump body. During reverse flow of pneumatic line, grease is sucked through the suction port in the pump. Spring force through follower plate exerted on the top surface of the grease (filled in the reservoir) makes the suction of the grease positive and easier. The grease thus filled in cylinder is ready for ejection. Pump is mounted on machine frame. Suitable for grease upto NLGI-II. Grease is filled through filling port provided on the body. RESERVOIR CAPACITY 1.5 Kg. 10Kg. DISCHARGE OF GREASE PER PNEUMATIC CYCLE 3-10 gms. 5-50 gms.